I'm using the Engilsh-Dvorak keyboard-layout; My second keyboard language is Hebrew, which has nothing to do with Dvorak but the hot keys (e.g if I'm writing a document in Hebrew and want to make some bold text using Ctrl+b). 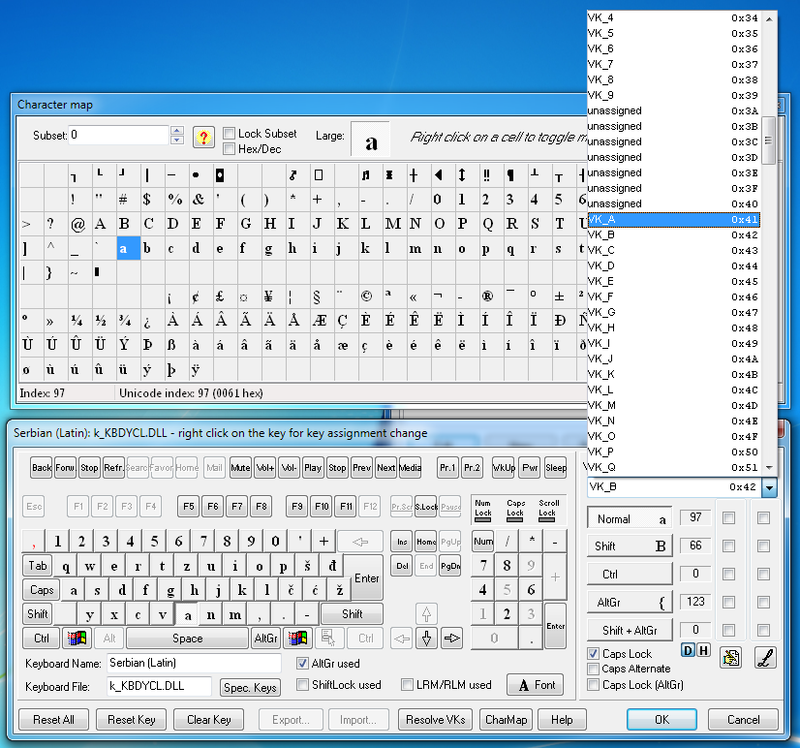 The default Hebrew keyboard that comes with Windows (7 and below) has a shift mode which matches each Hebrew character with its matching English QWERTY character ). Obviously I'd want to use the Dvorak corresponding key rather than the QWERTY one, so I created a Hebrew-Dvorak keyboard with a software called Keyboard Layout Manager (KLM) which creates new keyboard layouts DLLs. It works just fine for the shift key, however, Ctrl-key triggered hot-keys (e.g Ctrl+l in FF) are being matched to the corresponding QWERTY key. I've examined the properly working English-Dvorak layout using KLM and in it's "Ctrl+ pressed" view, there isn't any character that's matched to any key but still I tried to encode the Hebrew Ctrl+ pressed keys to work with their matching Dvorak keys, yet it had no effect. However, don't forget that the 'A' key also have the VK_A value, so you need to change its Virtual Key value to 'B', or something else. You can let the computer resolve all the virtual key assignment duplicates by clicking on the Resolve VKs button. I would guess that simply put, the computer only recognises the shortcut keys in one language and you are using the other. For example, you may be pressing Ctrl+א but the computer is seeing Ctrl+A. My guess would be you have to go in to configuration for whatever programs you are using and remap the program to have Hebrew shortcuts. Obviously this will be program dependent. Not the answer you're looking for? Browse other questions tagged keyboard-layout language hotkeys dvorak qwerty or ask your own question. How can I easily toggle between Dvorak and Qwerty keyboard layouts from a Linux system console? Windows 7 and international Dvorak keyboard layout with dead keys?